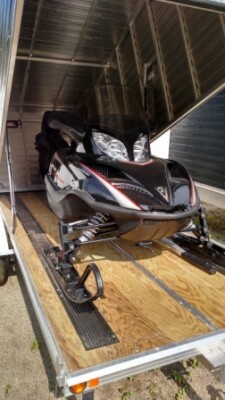 2004 Arctic Cat T660 2up Touring Sled snowmobile, 464 original miles, electric start, 4 stroke, turbo charged, electronic fuel injection, reverse, heated grips front and rear, runs great. 2012 Blizzard clamshell single trailer (purchased new), Drove from dealer to parking lot, has less than 50 miles on it. Excellent condition comes with new spare tire.